Hanumanji is the eleventh incarnation of Shiva Bhagavan. He is the son of Anjani and Pavan Deva (God of Wind). As a child he was blessed by all of the Gods to have infinitely strength, knowledge and wisdom and is known as the greatest devotee of Shri Rama. Hanumanji is noted for crossing over the ocean and finding the whereabouts of Sita Maa who was kidnapped by Ravana. He also burnt the demon kingdom of Lanka and assisted in the building of the bridge for Lord Rama to cross. Hanuman fought many demons in the battle between Shri Rama and Ravana and also brought the Mool Sajivan (herbal plant) to revive Lakshmana from his unconscious state of being. He also brought the news to Bharata and the citizens of Ayodhya of Lord Rama’s return after fourteen years of absence. Shri Rama had instructed Hanumanji to remain on earth for the remainder of the yugas (Satyug, Tretayug, Dvaapar, and Kaliyug) and as long the Lord’s name is chanted. Shri Rama also stated that if anyone wishes to gain his blessings, they must offer prayers to Hanumanji. 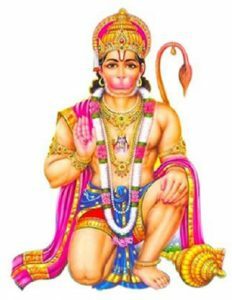 As a result, Hanumanji is worshipped more than any other deity and is pray to for the removal of problems and blessings. Hanuman is one of the most popular in the Hindu pantheon. Hanuman is worshiped as a symbol of physical strength, perseverance, and devotion. In the ancient Indian epic, the Ramayana, Hanuman appears as the hero’s (Lord Rama) invaluable sidekick. His most famous feat, as described in the Ramayana, was leading a monkey army to defeat the evil demon king Ravana, who had abducted the wife of Lord Rama. Hanuman rescued Rama’s wife, burned Ravana’s city to the ground, marched his troops into a fierce battle against Ravana, and vanquished the demons. Thereafter, Hanuman served Lord Rama forever. Hanuman’s story of triumph over evil is known for its astounding ability to inspire and equip readers with the wisdom needed to face ordeals and conquer obstacles of any size.